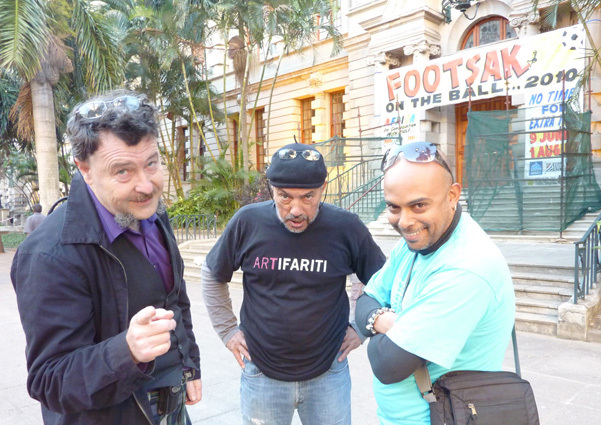 Three artists kick a ball from Durban to Algiers and back again in time for the big kick-off. Along the road the Footsak team, like modern day griots interact with «those who make it where they are» :flamboyant football fans, street philosophers, poets, eccentric artists, kings and queens … This fascinating journey through innovative Africa is reflected through video films, sounds, still photography and football paraphernalia. The installation shows complementary, participatory or divergent perspectives of the three artists. Visitors will experience the journey from Algiers to Durban, passing through the Sahrawi Arab Democratic Republic, Burkina Faso, Cameroon, Mozambique and South Africa. Lecture with Footshack Movie House’s artist/filmmaker Peter McKenzie followed by a Durban Art Gallery Tour of the Exhibition titled `No Time for Extra Time`- Africa in conversation with itself. Footshack Movie House is a special cooperative project that took place at the 30th Durban International Film Festival (DIFF) and created by artist/filmmakers Peter McKenzie, Doung Anwar Jahangeer and Guy-André Lagesse. The exhibition ends on 1 August. ‘Halakasha!’, a flagship exhibition celebrating the historic first FIFA World Cup™ in Africa, showcases a range of artworks dealing with the global phenomenon of soccer and the passion it evokes in Africa in particular. The exhibition’s title, ‘Halakasha!’ is drawn from the traditional South African celebratory cry on a goal being scored. The exhibition, curated by Fiona Rankin-Smith of the Wits Art Museum, also includes a series of documentaries and films on the theme of football as 10mn footage of Footsak on the ball 2010. These will run throughout the show, which is accompanied by an extensive catalogue.